Bound by Beauty teamed up with the AT&T Pioneers, the Girl Scouts of Troop 1305, members of the Miami Shores Community Church, and friends and neighbors in Miami Shores, to create a magical community butterfly habitat and the beginnings of a pine rockland, in an overlooked, grassy area of the church next to the school. We began last Thursday, one of the hottest days of the year, by carving up the beds. This might sound simple and straightforward, but St. Augustine grass has a tenacious grip on the earth, and is loathe to let go. 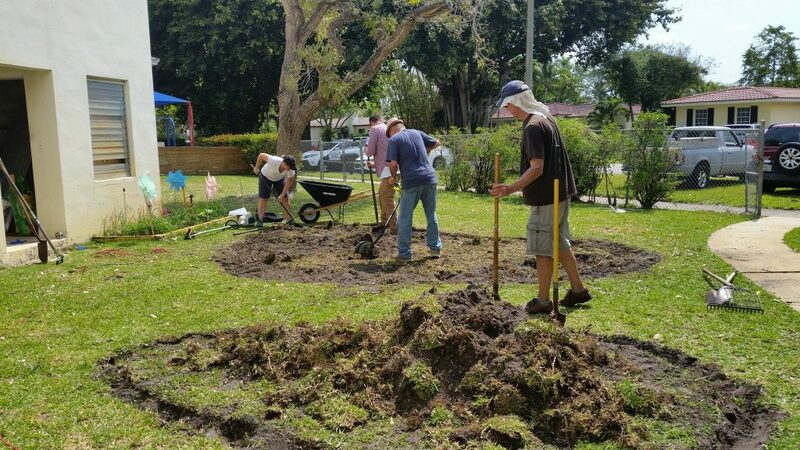 For those of us engaged in the fight against climate change, ripping out St. Augustine grass is a apt metaphor for the struggle to replace the unhealthy with the healthy, in order to heal our planet. One after another, our weed wackers failed in their attempt to cut through the tough leaves and roots of the grass. James Ard, a friend of nature who lives up the street, showed up in the nick of time with his powerful gas-powered edger, which one of the Pioneers employed to good purpose, while the rest of us used hoes and rakes to remove the remnants of the grass, which we piled up in another bed where the pine rockland habitat will be created. We almost finished the job, but the extreme heat leading to tomato-red faces dictated our temporary withdrawal. Building up the future pine rockland ridge with the remnants of St. Augustine grass. 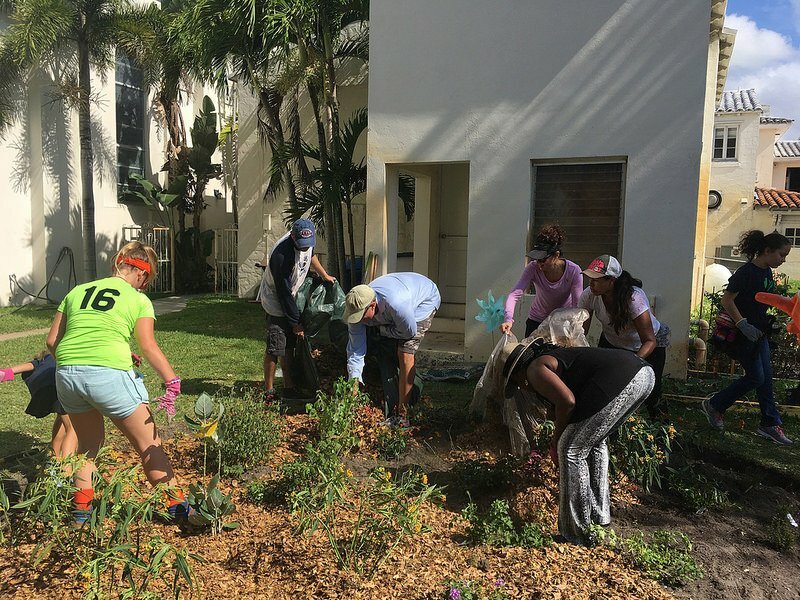 Saturday, the day dawned bright and sunny, but a nice breeze off Biscayne Bay, along with lemonade and snacks provided by the Girl Scouts, provided some comfort to those who returned to finish the job. 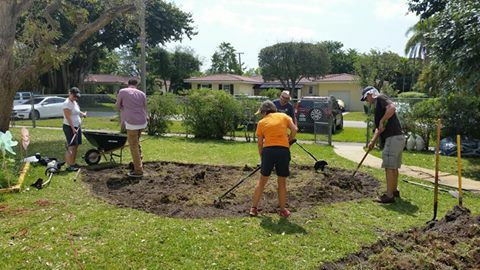 After removing the last remnants of St. Augustine grass, the crew got to work smoothing out the butterfly meadow planting bed, while others got to work labeling each plant and wetting down the future pine rockland and covering it with a plastic tarp in order to solarize it over the next few weeks. The wet soil will conduct the heat of the sun and kill the grass and other weeds. The Girl Scouts covered the ungainly plastic-wrapped pile with gaily colored butterflies, caterpillars, and a sign indicating its future use. 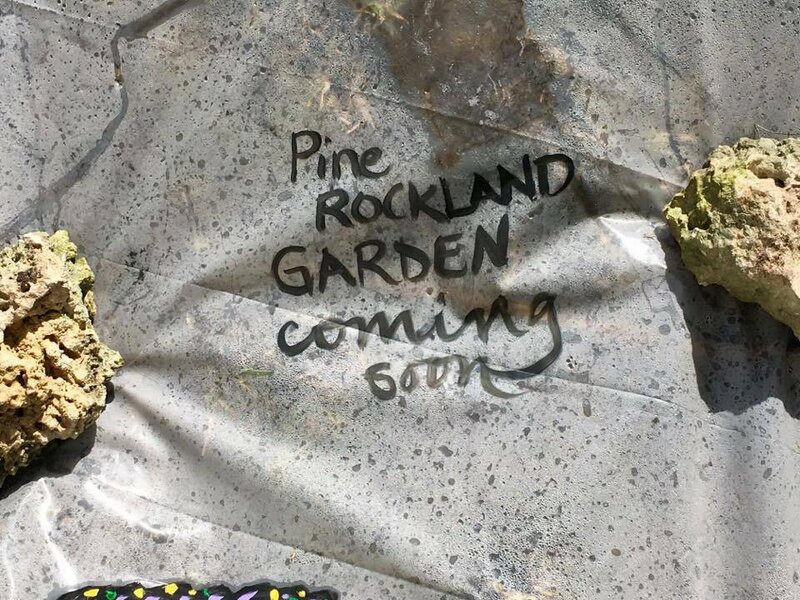 The future pine rockland habitat, which will be part of Fairchild’s Connect to Protect Network. When the butterfly meadow bed was raked smooth, Bound by Beauty placed the potted plants in their assigned location, educating those gathered on the purpose of each plant, while the Pioneers and other volunteers began digging holes and adding some homemade compost. 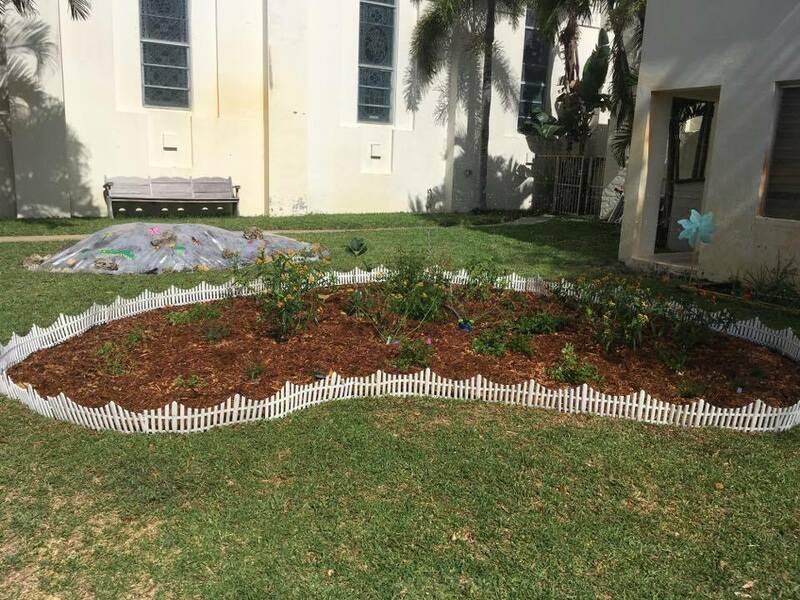 Then the leaves donated by numerous members of the community were added to the bed to the depth of a couple of inches, followed by one inch of natural eucalyptus mulch, to mollify those who don’t believe that leaves should be used as mulch ;-). Leaf mulch from pesticide-free gardens enriches the soil and keeps it moist, and discourages weeds from growing. The final task was to thoroughly water the new plants, and to place a temporary fencing around the meadow to ensure it survives recess! 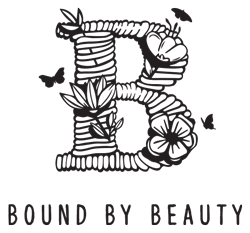 The purpose of the fence is to protect the plants as they become established. 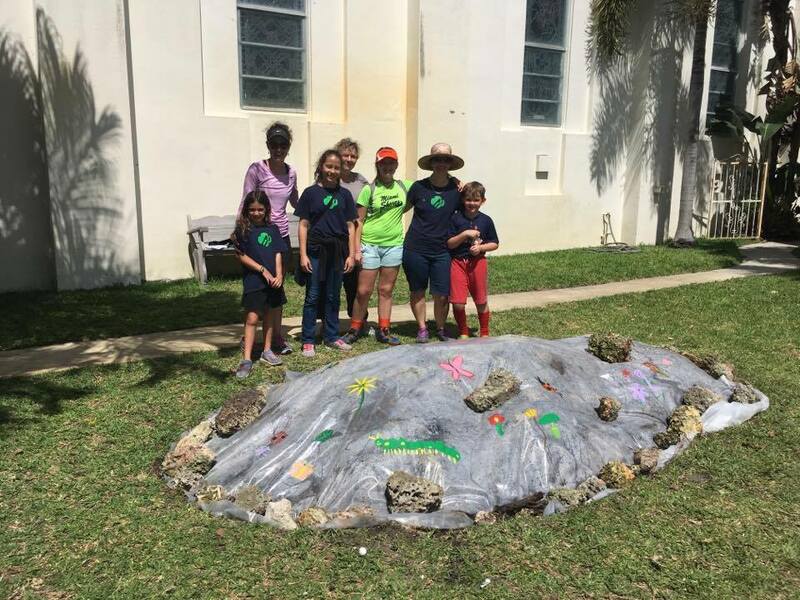 Many thanks to Pastor Meg Watson and the Miami Shores Community Church, the AT&T Pioneers, the Girl Scouts of Troop 1305 (and their mothers! 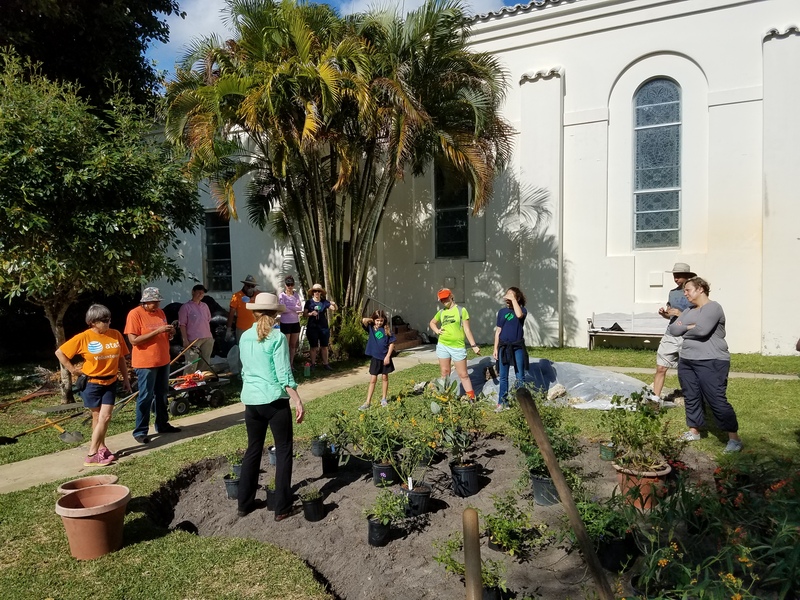 ), James Ard (who schlepped the plants up from Homestead and lent us his powerful edger in the nick of time), and members of the community who donated their time, their labor, their leaves, and their rocks!